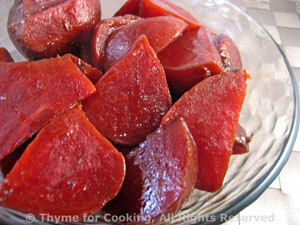 Balsamic Glazed Beets (Beetroot), Thyme for Cooking easy side. A touch of vinegar and sugar make these taste a bit like my favorite Pickled Beets. Be mindful of the beet juices as they stain easily. Cut the beets into large, bite-size pieces. Put into a small saucepan, add water, cover and cook gently until hot. Uncover, and drain. In a small bowl whisk together vinegar, sugar and oil. Pour over beets, return beets to heat and stir gently until sugar is melted and beets are well coated. Serve.